The New York City trade show was held at the imposing Coliseum on Columbus Avenue, the structure a staggering 323,000 square feet in all, with four floors for exhibition. On the cavernous main level, vendors packed the enormous space with their displays of jewelry, tee shirts, caps, cups, key chains, and other imaginative forms of souvenirs. Merchandise seemed to spill out of every nook, every cranny. Sounds crowded every space, too. Everywhere was the buzz of excited vendors, buyers, casual lookers, the hum of humanity meandering through aisles, pausing at displays, conferring, acquaintances calling out to one another. Clatter and chatter filled the air. Petite Earline, dressed smartly in an azure blue pantsuit, a color she knew echoed in her eyes, sat at her booth. She also knew she needed to draw attention to the gemstones Al had sent her to show and, most importantly, to sell. She’d heaped the stones on the display table so they lolled in happy profusion across the white cloth beneath them. Silky tiger’s eye with wavy bands of color, the blues and greens of chrysocolla—often mistaken for turquoise, tawny palm wood with its dark speckles. Potential customers strolled by, their eyes caught by the mass of little rocks. A few stopped, then moved on. As a few more potential buyers approached, Earline reached into the mound and pulled out a blue-gray stone. She examined it for a moment then nonchalantly popped it into her mouth. She chewed, and her eyes closed as she savored the delicious rock. She opened her eyes, chose another, this one with a rosy glow, and slowly, deliberately dropped it into her mouth. Again she savored the unique flavor. By this time a crowd had gathered, blocking the aisle. Several people wanted to eat a gemstone. Some started to reach for them. “No, no! You’ll break your teeth,” Earline laughed, amazed and delighted that there still were so many folks willing to be gullible, just as there were decades ago when she was with the carnival. Gingerly he raised the stone, placed it in his mouth, and with deliberation bit down. A twinkle crept into his eyes as he chewed. In the end, she took an enormous order for gemstones. A Kellogg representative wanted several tons of them for Corn Flakes’ trinkets. It was an order to match the size of this exhibition hall. “Well, Al,” she said. “You sent me there to sell gemstones, and I sold them.” It seemed to her the rest of the deal was his problem. 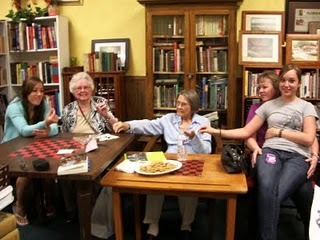 (L to R) Exchange student Elisa from Switzerland, Pat Tenzer (see p. 226), Earline, Pat's daughter, Janet and granddaughter Shelby at Chipola River Books & Tea--munching on gemstones. But a different person came along down the railroad, which went right by the satsuma patch. It was Grady Hamm, who at his own inspiration yelled, “I’m gonna shoot. You’d better get outta there!” An unexpected voice, an unpredicted twist! All the other kids had run away by the time Grady found Broward, who breathed an obvious sigh of relief when he discovered it was just Grady Hamm trying to scare them all. And at least someone did finally get him off the wire and rid his overalls of all those satsumas. During that scramble, Earline had fallen on the railroad tracks and cut her knee. She would have that scar the rest of her life to remind her of the satsuma episode. And as if that weren’t enough, she’d have her daughter writing about it for everyone to see. As I wrote earlier, this blog seems a perfect place to share some of the memories and events that didn’t make it into the book. One of Earline’s memories that I love is about her Granddaddy Stevens. For me, this scene evokes the peacefulness of a summer evening, the comfort of likeminded neighbors, and the sweet simplicity of a time gone by. Of all the places the family lived, Earline liked the Brunson place best. Here she and her family stayed in a small house a few hundred feet down the hill from the main home, but still on Brunson property. For the last few years of his life, until 1937 when he passed, Granddaddy Stevens, lived with them. At night Judge Brunson and Granddaddy would sit on their respective porches a partial hillside apart. Judge Brunson would start out singing— always church songs, his voice rumbling out from deep within. Then Granddaddy Stevens would softly join in, the two sonorous voices rising and blending in a distant sweet harmony. The comforting sound floated out into a darkness sporadically interrupted by the twinkling of myriad fireflies. Rock of ages, cleft for me .. . . Amazing grace, how sweet the sound.